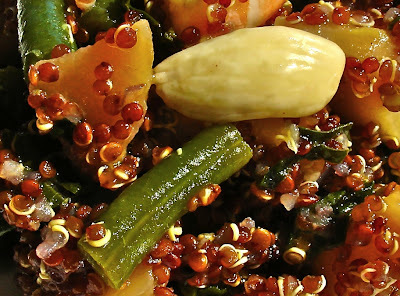 Mystery Lovers' Kitchen: Who Knew Quinoa Was So Cute? Who Knew Quinoa Was So Cute? I had a good chuckle on Saturday when Lucy said she had posted a healthy recipe and was now going for decadent chocolate cake. I'm doing the reverse. If you're like me, you love to try new foods. 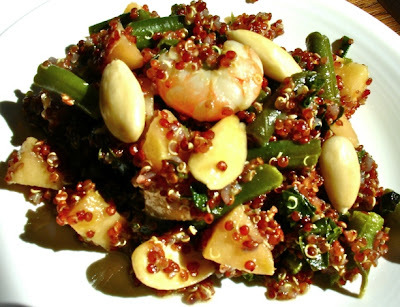 The funny thing is that quinoa (pronounced keen-wa) is anything but new. In fact, it goes back to 3000 B.C. Apparently the Incas revered it. I've been hearing about all the fabulous health benefits but hadn't gotten around to trying it. But don't let the healthiness scare you. It's fun food! It grows on a stalk and while we think of it as a grain, it's apparently the seed of a leafy green. It's loaded with protein, calcium, iron and vitamins. If you don't really care about that -- it's also quick and easy to fix. I followed a recipe since I've never made it before. 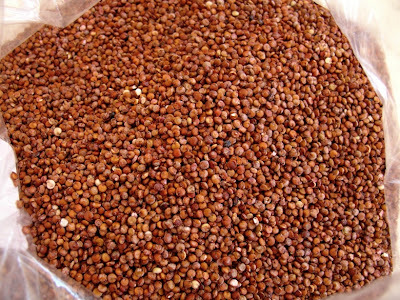 My red quinoa cooked in 15 minutes. It's tiny, maybe a little smaller than sesame seeds if they were round. When it cooks, it swells a bit and gets a little tiny curlicue on it -- tell me your kids won't love that! When you bite into it, there's the nicest little crunch. It would add great texture to a lot of dishes. People describe it as nutty, but I think it has sort of a bland inoffensive flavor that picks up other flavors well, sort of the way rice does. I ran across a fabulous recipe from the Fig Restaurant in Santa Monica. It's a vegetarian recipe, so I switched it up a little bit and replaced the butternut squash with shrimp. I have to confess that I felt a bit plebeian when I made the recipe because they used haricots vert, which are wonderful, but impossible to get where I live, at least in March. Don't tell them, but I used frozen green beans. In addition, I used wildflower honey instead of orange blossom honey, and ordinary almonds. I couldn't duplicate all of their upscale ingredients, but it was delicious anyway. This would be a wonderful go-to recipe for vegetarians. Possibly vegans, too, but there's honey in the dressing, and I'm never sure if vegans eat honey. However, don't let the fact that it's a salad fool you. This is one hearty dish. It's not heavy at all, but unlike some salads, it doesn't leave you looking for something to nosh on later in the day. It's a meal in itself. The chef who put this recipe together must be amazing. The orange and honey dressing is the perfect sweet complement (it makes a lot, though, you'll have leftover dressing). The almonds add a nice crunch, and I know I'll be cooking more dishes with quinoa and apples because they go together beautifully. I usually think of a salad as something I can put together fairly fast. This is a warm salad, with an interesting array of components, but it's not a quick fix. Don't try this on a day when you're in a hurry. The original recipe says it takes an hour to prepare, and I think that's accurate. With the original butternut squash or sweet potatoes instead of shrimp, it would be a wonderful meal for meatless Mondays! Note: I used shrimp in this recipe, but since I wanted it to be more about the quinoa than the shrimp, I only used 16 medium shrimp. You might want to use larger shrimp or more of them, in which case I would recommend cooking them separately and combining with the salad when cooked. I also suspect that the vinaigrette would make a fabulous marinade for chicken tenders that could be cooked on the grill and added to the salad. Bring the orange juice to a simmer and cook, simmering for about 15 minutes, until reduced to 2/3 cup. Cook the green beans (frozen work if you can't get them fresh) but don't overcook them. Make sure they're still nicely green. Bring the stock to a boil and add the quinoa and rosemary. Cover and simmer for 15 minutes. In a medium pan, heat the canola oil and add the Swiss Chard, the apple, 1/4 teaspoon salt and a pinch of pepper. Saute about 5 minutes, until "crisp-tender," then add 1/4 cup vinaigrette and the shrimp, making sure the shrimp cooks through. Add the green beans and toss together. Remove from stove and pour into a large bowl. Drain the cooked quinoa, remove the rosemary, and add to the items in the bowl. Add 2 tablespoons almonds to the bowl, dress with additional vinaigrette (go easy), toss and add salt and pepper to taste. Ladle onto plates and garnish with almonds. Where did you find the red Quinao? All I've found is the white. Linda, I saw it in bags at Fresh Market a few weeks ago, but I bought it at my local health food store. They had it in bags as well as in bins. I don't know what took me so long to try this. Maybe it just sounds odd to be eating something that goes back so far in time? But it's a lovely food. I'm trying it baked today. 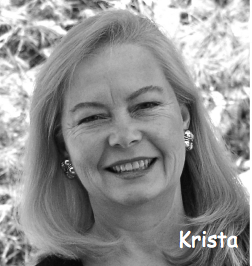 What a fun coincidence, Krista! We made Quinoa here last night. It was more of a southwestern version, with corn, black beans and cilantro. Loved it. It was only the second time I'd made quinoa, but I'm in love with the little grain. I'll definitely try this version. I can see where it will become a staple here. That really is a coincidence, Julie, because I thought of you and your vegetarian daughter right away. I bet your family would enjoy this! I'm in love with quinoa now, too! Krista, cool recipe and quinoa is gluten free so I'm trying this one!!! Thanks. Love your description of the grain. 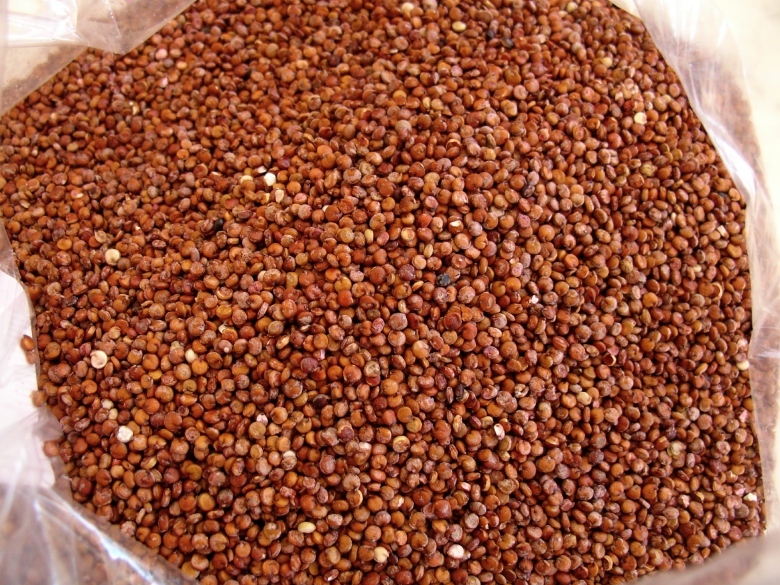 Quinoa would be gluten-free because it's not really a grain. I bet you'll like it! 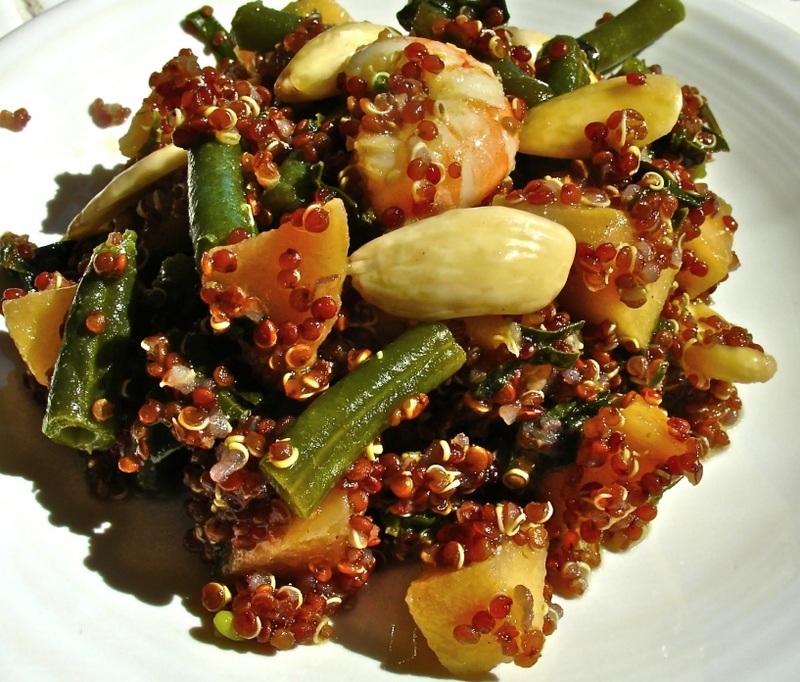 I had this for the first time not long ago, a warm citrus quinoa side dish. I didn''t cook it but asked how it was made, and the cook said it was white quinoa boiled and tossed with a little orange juice, orange zest, olive oil and fresh parsley. It was very delicious. Ramona, that sounds like a lot less work and probably just as good. I'll have to try that! This looks like a tasty recipe. I've used quinoa for years and prefer the red variety. It's a wonderful substitute for those of us with wheat sensitivities. Always looking for new recipes. Thanks! Erika, why do you prefer the red variety? It's an amazing food for vegetarians. So nutritious! I hope you'll share some of your recipes for quinoa, Wendy.